I'm a British Web Designer/Developer and Graphic Designer with 20 years industry experience currently residing in Melbourne, Australia. I first started designing and building websites for clients in 1998 whilst at University and have worked for a number of UK design agencies. In May 2007 I started my own design studio and have been working for myself ever since. I've had the opportunity to work on a variety of large and small website design projects including ecommerce, branding, packaging design, illustration and mobile app design. I'm an old school designer and like to sketch my ideas on paper first before going to screen. This makes the project process much more creative and any issues can be quickly identified before any digital work begins. In November 2016, I moved with my family to Melbourne, Australia and am currently taking on new projects and always interested in a new challenge. Reach out to hello@iamketan.com.au to connect or DM @ketanumistry on twitter! I've had the wonderful opportunity of working on all types of projects over my 20 year career and there'd be too much to display on a portfolio. So, I thought I'd summarise all the key events in my life and career on a beautiful timeline. Studied Business Information Technology (BA Hons) where I learned all about networks, web design, relational databases and project management. Built my first CMS from scratch using PHP/MySQL for a local news publication - there was no decent CMS out there at the time, so I built one - story of my life! Blown away by Hillman Curtis! "Flash Web Design" by Hillman Curtis. Published in 2000 by New Riders. I decided to follow up my education with a Masters degree in Interactive Multimedia Production at the University of Huddersfield. In this course I learned all about Adobe Illustrator, graphic design, 3D modelling and web design. Got my first Apple Mac - a shiny white iBook which came with the first version of OSX. Worked as a Graphic Designer/Front-End Developer for a small Manchester based studio building client websites using Macromedia Dreamweaver and Fireworks. Joined the web solutions team as Senior Designer/Front-End Developer. Worked with clients such as the NHS, Carcraft and Renault. I set up my own web and graphic design business called Dubbed Creative in Bolton. I worked on all types of projects from ecommerce to product packaging. Clients included Carcraft, LeagueRepublic/FA and Peninsula Business Services. Branding + website for BCi, europe's leading Video-on-Demand and IPTV integrator. Brochure, website and product packaging for manufacturer, Buckingham Cookware. Ecommerce website + bespoke development for IMO Records. UI/UX design for LeagueRepublic, a cloud based league management tool. Designed a 250 page book containing core task guides. Ecommerce website design and build for mobility aids provider, Ability Superstore. Website, branding and menu design for a popular Italian restaurant in West Yorkshire, UK. Created a series of microsites for the UK's largest car supermarket - Carcraft. UI/UX design for HR Online, a cloud based employee tracking tool. Website and menu design for Thai restaurant. Small website for a recycling solution company. Dubbed Creative's work was featured in the renowned Web Design Index publication (2008) by Agile Rabbit. Featured in Web Design Index 8 for the Marcus Oleniuk Flash website created in 2006. Out of sheer panic, I built the Shopit ecommerce platform which would be used by all my future clients. Version 1 quickly becomes version 2! After redesigning the Dubbed Creative website it was referenced on some popular web design websites. A set of carefully crafted icons designed for the new Dubbed Creative website. The new Dubbed Creative website featured a unique experience with animation, bold fonts, colours and a distinctive navigation system. My office in Salford, Manchester is broken into on New Years Eve and all the work I've completed to date is stolen. I have nothing to show for the previous years other than my portfolio on my website. I start using Dropbox! Version 3 of my Shopit ecommerce platform is released with all the bells and whistles; live product editing, product conversion reports and ebay/amazon order syncing. The Shopit 3 admin bar which enabled store-front editing. Shopit 3 snippets allowing full live editing of site content. Co-founded Manchester based agency Project Octo which worked closely with ecommerce clients. I save the company's largest internet-only client from going under after a massive server outage which lasts for over a week. This is the most stressed out I have ever been in my entire career! I begin working closely with the Google Cloud Platform - App Engine and Compute Engine in particular. Built a simple stock management and scanning Android mobile app using Ionic and PhoneGap. Stockit, a stock management Android app. Stockit stock management Android app built using Ionic and PhoneGap. November 2016, I move to Melbourne with my family. The Art of Aardman exhibition in Melbourne. Celebrated our first proper New Years Eve in Melbourne 2017. A trip out to Melbourne's Royal Exhibition Building and the Museum behind. Light & Air exhibition outside the ACMI. Arthurs Seat in the Mornington Peninsula. Clear waters in the Mornington Peninsula. The view from Teddy's Lookout in Lorne. Shopit 3.2.6 is officially open sourced. My website (this one) is Site of the Day on Design Nominees. I leave both companies to do more of the work I enjoy and to start new ventures. 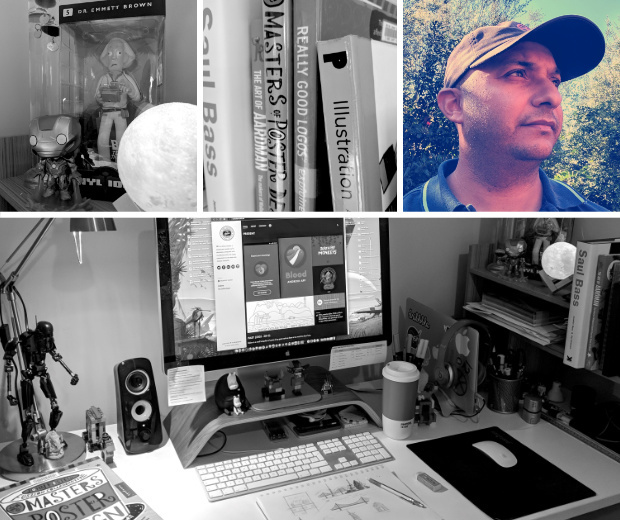 I begin freelancing as a designer/developer & consultant and continue doing work for some of my long-term clients. After years of waiting, trying, and eventually giving up, I finally get drafted into the prestiguous dribbble community thanks to @tombarrow. A shot I posted thanking Tom Barrow for the dribbble invite. We move into our own home in Melbourne after renting for the last one and a half years. I finally get to create my home studio environment. My home studio kitted it out in my own style. My desk is hidden behind shelving to create a nice quiet "zone" for myself. Rebuilding my book collection slowly after I had to leave all of them back in the UK. The Draplin book is missing from this pic!